Over 2,000 years ago, the ancestors of the Pueblo peoples, the Anasazi and Mogollon Indians, settled in the present day area of Mountainair in central New Mexico. Here the traditions of both cultures overlapped to develop the unique Tiwa and Tompiro speaking pueblos of Abó, Gran Quivira, and Quarai. The Anasazi and Mogollon borrowed from each other and adapted to the changes in their environment by creating new traditions that helped them survive. The adaptability of the Pueblo Indians proved useful centuries later when the Spanish entered their world. Today, Salinas Pueblo Missions National Monument preserves the history and heritage of the Pueblo societies and Spanish missions of Abó, Gran Quivira, and Quarai, which continue to stand as reminders of a time when the cultures of the American Indians and the Spanish converged. Spanish explorers first learned of the existence of the Pueblo communities in 1540, when Francisco Vasquez de Coronado led an expedition to New Mexico in search for the seven cities of gold. In his travels, he encountered a Plains Indian he called the Turk, who informed him of the existence of the wealthy city of Quivira. Coronado and his men followed the Indian to the city, but to their displeasure, the Spanish learned that the Turk had tricked them and that the city did not exist. After Coronado ordered the Plains Indian killed, the Spanish ended their expedition to find Cibola and returned to Mexico. Although they returned empty handed, Coronado’s expedition did not discourage other explorers from heading back to the region, and in 1598, Juan de Oñate led a party of Spanish missionaries and settlers back to New Mexico. In their travels, they discovered the resourceful Pueblo communities of Abó, Quarai, and Gran Quivira, where Oñate established a permanent colony for New Spain that he called Sal--the Spanish word for salt--which was abundant throughout the Salinas Valley. When the Spanish reached New Mexico in the 16th century, the descendants of the Anasazi and Mogollon Indians had already evolved into one of the most advanced and economically powerful cultures in the American Southwest. The Pueblo Indians, who had perfected their craft making and agricultural and hunting techniques, commanded the Indian trade paths with their abundance of goods. Because of their superior architectural skills, their impressive stone and adobe homes dominated the southwestern landscape. The Spanish found the Pueblo pottery, farming, and building techniques impressive, and recognizing the value of the American Indians’ skilled labor, they developed the encomienda system, which eventually led to the exploitation of the Pueblo peoples. Through the encomienda, the governor appointed ranking Spanish citizens to protect, educate, and civilize a group of Indians. In return, the Spanish collected tribute in the form of labor, food, and material goods. Eventually the Spanish began abusing the system, and tensions grew as Franciscan friars attempted to help the Pueblo peoples. The church was powerless against the government, and the lucrative system continued. The encomienda was not the only system that created tension in the Salinas Valley; conflict also grew from the religious pressure that Franciscan friars placed on the American Indians. The clash of religions made it difficult for the missionaries to convert Pueblo peoples unwilling to give up sacred customs, which the Indians believed brought good fortune to their communities. The most important of these customs was the Kachina dance that the Pueblo peoples performed to their gods in order to bring rain, health, and abundant crops. The Franciscans attempted to stop the Pueblo people from performing these customs by informing the Indians that their people’s salvation depended on their conversion to Christianity. The Franciscans also established three mission churches, one at each of the pueblos in the Salinas Valley, where they added to the existing adobe structures the Pueblo peoples built before the coming of the Spanish. In 1621, Fray Francisco Fonte arrived in New Mexico and soon began establishing his mission in the Pueblo of Abó. 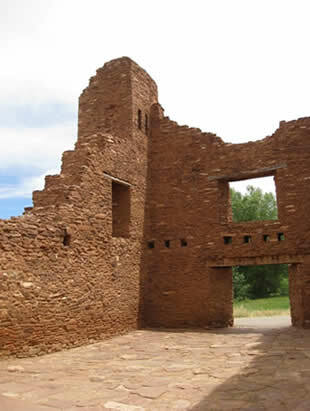 Initially, Friar Fonte converted the adobe buildings of the Pueblo peoples into temporary convents, where he slowly introduced the Indians to Christian traditions. Once the Pueblo residents trusted him, Fray Fonte began building the first mission church at Abó. By 1627, the Church of San Gregorio was finished, and around the same time, Fray Juan Gutierrez de la Chica, who headed the mission efforts in the Pueblo of Quarai, began building the church and convento of La Purísima Concepción de Quarai. Two years later, Fray Francisco Letrado arrived at his assignment in Gran Quivira, also known as Las Humanas, where he constructed the churches of San Isidro and San Buenaventura. The missions at Abó, Quarai, and Gran Quivira proved successful until Spanish officials began dictating how church figures should convert the American Indians. They complained that the Pueblo peoples spent more time studying Christianity than providing labor and began pressuring the Franciscan Friars to accelerate the conversion process. Although the missionaries wished to influence the American Indians gradually to give up their old religious traditions, they were less powerful than government forces. Eventually, this conflict between church and state led the Franciscan friars to destroy the Kachina masks and burn all kivas--sacred places where Pueblo peoples performed rituals and prayed to their gods. Ultimately, attempts to suppress the Pueblo peoples’ ancient religious beliefs failed. Although the Pueblo Indians were an adaptable people who could withstand environmental and social changes, what the Spanish brought, especially disease, proved too strong for them. As drought, epidemics, and natural disasters began to decimate the population of the Salinas Valley, the Pueblo peoples felt they had insulted the spirits, and when the Christian God failed to help the community, they returned to their old beliefs. As each Salinas pueblo fell victim to epidemics, the surviving Pueblo peoples began to leave the region and seek refuge with their kinfolk in neighboring towns. By 1672, the once thriving community of 10,000 inhabitants was reduced to 500 people. By 1678, the Spanish and Pueblo peoples completely abandoned the Salinas Valley. At Salinas Pueblo Missions National Monument, visitors can walk the interpretive trail to see the mission churches and the ruins of Abó, Quarai, and Gran Quivira. Tourists can also explore the museums at the park and picnic in designated areas at Abó, Quarai, and Gran Quivira. Camping is allowed in Cibola National Forest. The visitor center of Salinas Pueblo Missions National Monument, a unit of the National Park System, is located at 102 S. Ripley in Mountainair, NM. The visitor center is open daily, except on Thanksgiving, Christmas, and New Year’s Day. The Monument's summer hours are from 9:00 am to 6:00pm, and during the winter, the site operates from 9:00am to 5:00pm. Admission is free. For more information, visit the National Park Service Salinas Pueblo Missions National Monument website or call 505-847-2585. Many components of Salinas Pueblo Missions National Monument have been documented by the National Park Service’s Historic American Buildings Survey, including Church of San Isidro, Church of San Buenaventura, and Mission of San Gregorio de Abó. 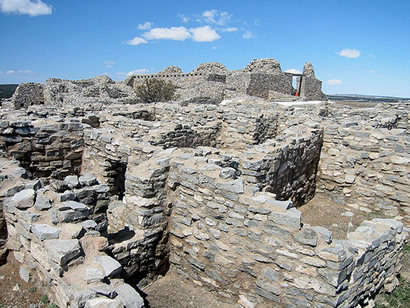 Salinas Pueblo Missions National Monument is also featured in the National Park Service American Southwest Travel Itinerary and in the Places Reflecting America's Diverse Cultures: Explore their Stories in the National Park System Travel Itinerary.